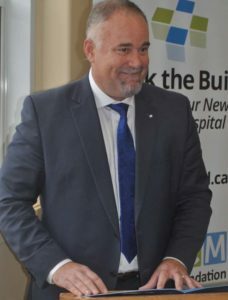 While Bay of Quinte MPP Todd Smith said he wasn’t in Picton to announce a new hospital just yet, he did bring important and welcomed news about the provision of health-care services in the region over both the short term and the long term Friday morning. Speaking at Prince Edward County Memorial Hospital (PECMH), Ontario’s government and consumer services minister announced the Quinte Healthcare Corporation (QHC) would receive $2.8 million in one-time funding this fiscal year to help with a surge in patients over flu season. 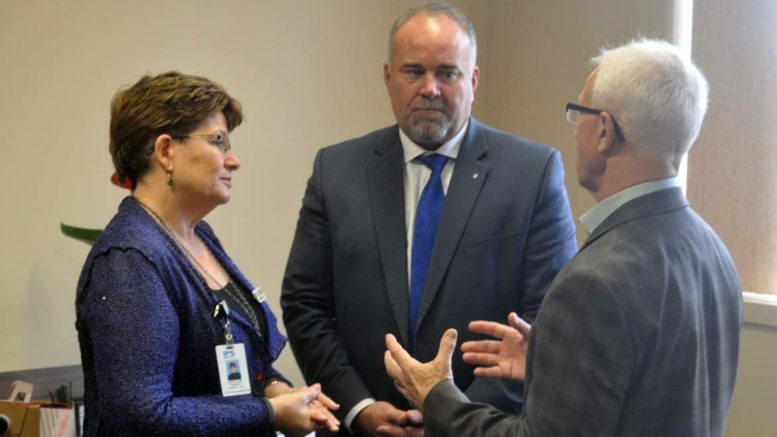 He also announced 128 long-term care beds were allocated in the Bay of Quinte region in the first instalment of a promise to deliver 15,000 over a five-year period across Ontario. That translates to support for 640 hospital beds. At QHC’s four hospitals — PECMH, Belleville General Hospital, Trenton Memorial Hospital, and North Hastings Hospital — that means 23 beds. “We know hallway health care has become a reality, unfortunately, in Ontario and we hope that this money will help alleviate the stress on emergency rooms and hospitals,” Smith said, adding the extra resources will allow doctors and nurses to work more efficiently. The minister also suggested that Minister of Health Christine Elliott and advisor Dr. Reuben Devlin have advised a team to look at funding hospitals more appropriately and adequately on a permanent basis. QHC president and chief executive officer Mary Clare Egberts said she was “absolutely delighted” by Friday’s news and said it sends a clear message to patients, communities, and care professionals that the province recognizes the pressures the hospitals are facing. She appreciated the gesture. Egberts said the 23 beds will be shared with more beds at each all four hospitals. With QHC being one system, she indicated the beds can be moved where they are most appropriate. Egberts indicated the funding will last until March 31, but said “you can’t magically close beds” so if they’re still in operation, they’ll be kept in use for the duration of the respiratory flu season. She indicated QHC will likely have to add a number of clinicians to support the new beds in an effort to make sure the hospital is adequately staffed to meet need. According to Egberts, QHC had a bad week last week with “more patients than we are actually able to deal with.” She said that overtaxed emergency rooms and intensive care units can create blockages for patients to be treated and safely sent home. The region’s aging population and high incidence of patients with multiple chronic diagnoses add further challenges. While the funding will help in the coming weeks and months, Egberts encourages people to get their flu shots and to avoid hospital visits while suffering head colds or minor injuries. In the big picture, investments in long-term care will also alleviate pressure on front-line care at hospitals. Smith said among the first 6,000 long-term care beds delivered in a commitment of 15,000 over five years, 128 are to be built in a new facility proposed by the Mohawks of the Bay of Quinte. He also hinted that Picton will be on the radar for additional beds as the commitment rolls out. Egberts is looking forward to the investment and the transitioning of alternate level of care patients (those who do not more acute health services) from hospital beds to more appropriate long-term care facilities. Mayor-elect Steve Ferguson was also pleased with what he heard, stating the health-care needs of Prince Edward County and the region must remain top of mind for council and the endorsement from the provincial government shows its confidence in QHC and in the local hospital itself.